Turns out what we eat is not all that matters when it comes to healthy digestion. Ayurveda tells us that how we eat also plays a big role. It just so happens that those rumours we all heard about eating slowly and chewing food more than a couple of times before swallowing was more than just good sense. 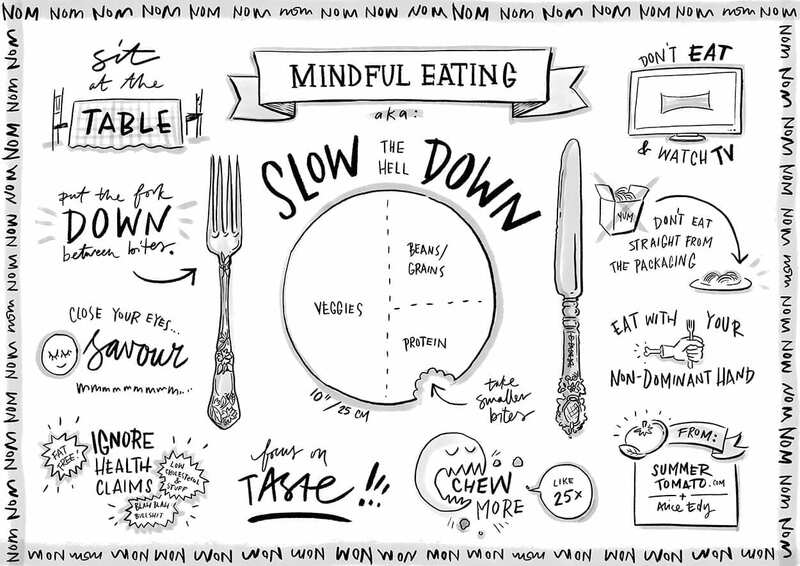 By mindfully eating we can settle upset stomachs, reduce bloating, control weight and aid the entire process of digestion. The holiday season is famous for tempting us all to overeat and over-drink for days on end. Massive consumption is everywhere we look, everywhere we shop and at every event we go to. It’s advertised, talked about, written about and pretty much inescapable. So let’s embrace it! Just one, simple catch: Indulge mindfully. Nothing enjoyable in life needs to be negative if you approach it the right way. Our relationship with food on a day-to-day basis is dramatically going to affect how our bodies function and how we feel as a whole. Picking healthy options and eating mindfully with the sole purpose of nourishing and refuelling the body is going to change up the diet game for good. Pulling up at a drive-thru, for example, and scoffing down a highly processed jumbo meal whilst concentrating on traffic… is pretty much the exact opposite of what we’re aiming for. Eat at a moderate pace in a calm, seated environment. When we eat in a hurry, on the go, or with a distracted state of mind, we often swallow things before proper mastication has occurred. Chewing food well before it reaches the stomach allows the acid-filled organ to strain less and makes it easier on the rest of the digestive system. Bottom line: Let your teeth do all the work and don’t eat in a hurry. Before placing each bite of food into your mouth, make an effort to experience the smells first. Smells are responsible for 70% of our ability to taste. Ever had a blocked nose and not been able to taste a damn thing? It takes the joy out of one of the best things life has to offer. Enjoying a delicious meal with the full spectrum of taste is really going to get the digestive juices flowing. Think: Fork ➜ Nose ➜ Mouth. Drinking water at room-temperature or having herbal teas throughout the day will keep you healthily hydrated and help deal with bloating. Cold beverages are a bit of a challenge for our digestion as the whole system has to work overtime to bring cooler substances up to body temperature. In fact, studies show it takes an average of 30 minutes for the body to digest warm liquids, and at least double that to digest cold liquids. This is because the body cannot absorb the cold liquids until they are sufficiently warmed. That’s a lot of overtime for a few ice cubes! Even if all you can spare is 5 measly minutes after each meal, take that time to really let yourself relax, allowing for the digestive process to benefit from being the focus of your energy. If you immediately get up to start clearing, or heading out the door, you’ll be decreasing circulation to the digestive system and hindering food absorption. All it takes is a bit of time management to allow for each mealtime to have a dedicated time thereafter for rest. Call it the DTD (Dedicated Time for Digestion). There are those that say breakfast is the most important meal of the day, and that may be right, but don’t make it your biggest. It’s essential to get your systems rolling first thing in the morning, without overwhelming them. Once you’ve been busying around working up an appetite for the first half of the day, it’s time to satiate! There’s a famous Ayurvedic principle which says “when the sun is at its highest point of the day, the digestive fire is strongest.” Ayurvedic teachings believe that we are a reflection of what’s happening in nature. At lunch time the sun is highest, our digestive systems are functioning optimally and there’s plenty of time left before sundown for our bodies to deal with the intake. Dinner, as famously suggested, should be the lightest meal of the day. If your body is working hard digesting a large meal whilst you’re sleeping, it can be hugely disrupting and can often cause bad dreams, heartburn, fatigue and weight gain. If you’re not feeling hungry, don’t eat. Your body will let you know when it’s in need of sustenance, and then it’s up to you not to ignore the signs! It’s normal that some people need a good few hours after waking to feel ready to eat for example. That’s not unhealthy, it’s just how their body has adjusted. If you’re like that, make sure you have a healthy snack on stand-by for when hunger strikes. Forcing food down when you’re just not into it is unnecessary and could make you lethargic, bloated and nauseous. On the other hand, not eating enough throughout the day can lead to all sorts of problems, especially relating to metabolism. At The School of Natural Health Sciences we offer 60 courses in holistic health therapies, five of which are nutrition based – Clinical Nutrition, Advanced Nutrition, Child & Adolescent Nutrition, Sport & Exercise Nutrition and our most recent addition: Nutrition for Age 50+.We also offer a course in Mindfulness, one of increasing popularity and relevance in all areas of life. Set yourself up for success with our unique diplomas that are recognised in 26 different countries. Getting qualified at our school is a completely stress-free process and involves no deadlines, no start-up expenses and no need for travel. Since our learning facility is entirely online, it’s up to you to study at a pace and location that best suits your needs. Go solo or benefit from one of our trained tutors that are on hand to help you every step of the way. Now that’s what we call holistic education!